Team-ups can be pretty sweet. From Archie and the Punisher, all the way up to universe shattering get-togethers like Deathmate and Marvel vs. DC. Your favorite characters, coming together to fight and prevent something only they can accomplish as a team. Sometimes it can be epic, with fan approval and wide spread acclaim, while other attempts are plagued with schedule difficulties, creative differences, and just the wrong mix of elements coming together to make a terrible event. It happens. I’m sure we all have our favorites, as well as those that are very cringe worthy, and some that just plain don’t make the first bit of sense to any of us. The in-house team-ups are extremely common. It’s almost like every other issue, another hero, or villain, team-up is taking place. Spider-Man and Daredevil, Superman and Batman, etc, etc. It’s commonplace, just like the universe they live in, respectfully. When it’s a company crossover though, it doesn’t happen nearly as often. It can be awesome. AWESOME! JLA/Avengers, X-Men vs. Titans, Superman vs. Spider-Man. Epicness! Others, well, not so much. (Must I namedrop Deathmate, again?) All of that brings me to this. Spawn and Batman. Todd and Frank. Two icons, both in the worlds each character comes from, and in the business we love to read and review so much. At this time, Todd was at the top of his game, and Frank was right along side him. Mcfarlane had Spawn, Miller had Sin City, 300, and much more. Both, coming together , to work on an issue together, each taking what they were best at. Miller with the writing, Mcfarlane with the visuals. How does it fair? Is it worth the time they put into it? Does it even hold up in continuity? Let’s find out, shall we? 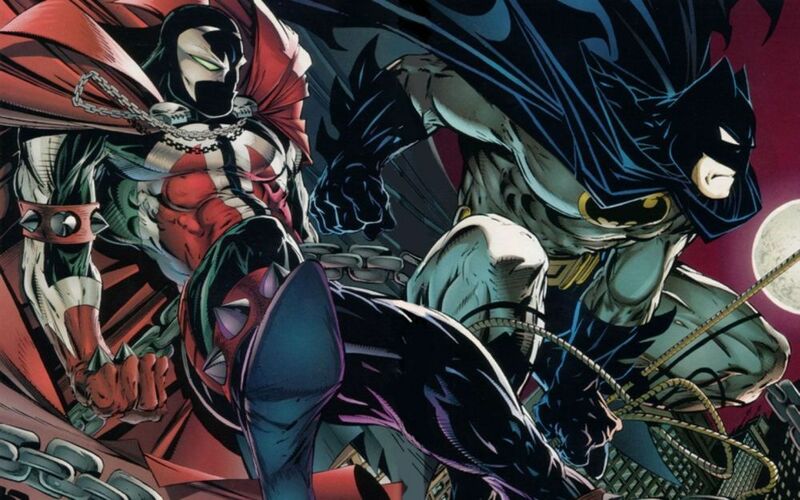 Come with me, as we swing into action and review Spawn/Batman! Gotham City. A wounded Batman stands rigid, broken punks lay at his feet. Those hospital bound jerks are but a small step toward Batman’s real goal: a warehouse full of weapons, sold to Gotham street gangs, intended for a war that never happened. The typical is here. Guns, grenades, rocket launchers, and also, the high-tech devices, made to make a man superhuman, to make that man able to hurt… to kill. Batman’s anger wells up inside, but he is allowed only an instant of it’s viciousness as he’s attacked! A machine, ready to turn him to dust smashes the Caped Crusader against the wall. Another crash, and Batman goes flying, more pain given to his body. Batman has but one chance. Put on a metallic gauntlet, hope it’s enough to give him the edge. With punches filled with brutality, Batman discovers that this machine isn’t all wires and circuits. It has flesh inside it. Could he save what part of it is human? Maybe, but time is running out. A self-destruct has activated, and the Dark Knight only has seconds to act. Smashing and pulling, Batman frees what little of the machine is human. With a severed head in his hands, Batman leaps, escaping with his life. Who built these machines? Why do they need this human component to run? Batman will find the answer. Batman will learn that the answer lies in New York City. It’s a cold night. A Dark Knight. This is not Frank Miller’s best work. Toss the stones at me all you want, but hear me out. It has a plot, sort of. Batman must find out why this machines are being built, and for what purpose. So, with some handy detective work, Bats makes his way to Manhattan, where, for the next third of the book, proceeds to beat up, and get the crap beaten out of him by Spawn. No mystery, no suspense, no real reason for them to be kicking dirt at each other. They just, for pretty much the rest of the book, trade blows and talk smack. Yeah, Spawn burned two dudes, but is that enough reason for Bats to kick bootie, action style? Frank Miller’s script feels extremely flat, one dimensional, and poor. There is no real dimension to any of the characters. Batman and Spawn have such rich history, are very character driven individuals, and, when written well, they tell one helluva story. Frank Miller’s other work on Batman is, without question, some of the greatest stories ever told of the character, but this, even falling in the Dark Knight continuity, holds no weight when compared to any of that. Even if it falls in the realm of Spawn continuity (which is kind of does, and kind of doesn’t) still holds no ground to the amount of work Mcfarlane put into the character’s backstory. Here, in script form, Miller fails, and it’s a slow, painful read. The saving grace of this book is the artwork. 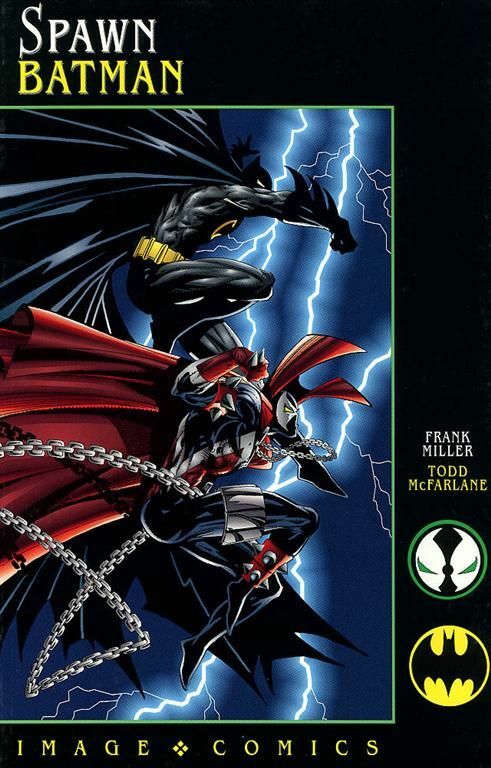 It can be said that Todd Mcfarlane is one of the greatest artists of our time. He’s one of my personal favorites, with his work on Batman, Spider-Man, and of course, Spawn. The pencilwork is solid, with motion, emotion, and visual drive all present and evident. Mcfarlane puts all of his work into the detail, and it’s awe can’t be denied. Batman looks menacing, reacts with razor sharp skills, and fills the page with his presence. Todd’s work on his flagship character is beyond par. Mcfarlane is at the top of his game here, and no line is left without its due time of attention. I can’t say much more about Todd Mcfarlane’s art, save for it’s expert craftsmanship and absolute delight to enjoy. I remember a time when crossovers like this were such huge events. When Marvel and DC crossed over, having the best of the best kicking each other’s butts, my friends and I went crazy. It was the biggest event of the summer. We placed our own bets on who would win. When Spawn/Batman hit shelves, it was a little different. A Spawn comic, to me, was something that was more hard edged than your average Marvel or DC book. To read a Spawn comic, it almost felt like you were doing something you weren’t supposed to do, or like cheating on Marvel and DC. I loved reading them as a teenager, and when Batman crossed paths with Al Simmons, whoa man! Batman comics were as edgy as I’d seen in DC (not counting Vertigo. That’s its own thing entirely. ), and for Frank Miller to team up with Todd Mcfarlane? Count me in! I enjoyed it as a kid, don’t get me wrong, but I felt then as I do now about certain things. Batman was pretty much a jerk through most of the issue. Like, out of character kind of jerk. I’d never read Batman like this, and I wasn’t really digging it, so to speak. Maybe I had my expectations too high for how the Dark Knight should or shouldn’t act, and I was probably very naïve in how writers make the character their own, but I still knew that you had to hold on to at least some of what the character was about, right? Here, it didn’t feel that way at all. No Knight of justice, no quick and efficient Caped Crusader. Just some grumpy guy doing serious trash talk and filled with a crap ton of anger. I couldn’t get into that then, and I still can’t, after reading it again for this review. Crossovers are cool, and can be such fun to see your favorite characters going against, or working with each other. I know that they have to beat the snot out of each other to start, but they should usually shake hands at the end, right? Maybe that’s too much to hope for in this case. Maybe that doesn’t make any sense at all in the case of Batman and Spawn, two of the least likely to EVER shake hands with ANYONE. EVER. It is a product of its time, though, and that’s unfortunate. I would have very much wanted the team-up of Frank Miller and Todd Mcfarlane to be more than, well, this. Parental Concern: LOTS of violence, and some blood too. If your parents let you watch PG-13 flicks, than this is pretty much OK.